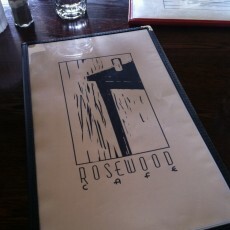 I hadn’t been to Rosewood Cafe in a while, so I stopped in for dinner last night with a friend. It’s one of those places that’s hidden away, and if you don’t drive by it every once in a while, you might forget it’s there. 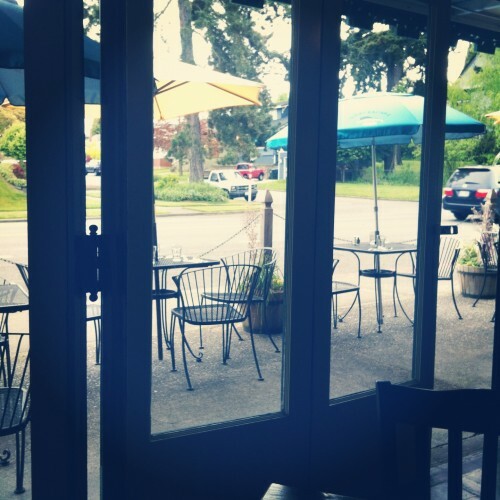 If you’ve never been to Rosewood before, it’s a quaint cafe tucked into the Proctor neighborhood of Tacoma, near the University of Puget Sound. They specialize in sandwiches, salads and soups, and also have beer, wine and local Valhalla coffee. I’ve heard from many people that it’s super kid-friendly, and the casual vibe and sidewalk dining during the warmer months is really inviting. They’re open for lunch and dinner…though I’ve always wished they were open for breakfast or brunch. It would really be the perfect spot to bike to on weekend mornings for a breakfast sandwich, but I’m going to have to keep dreaming. No breakfast yet. 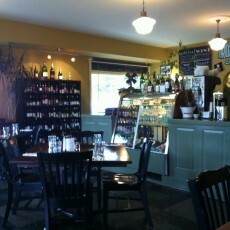 You can check out their lunch and dinner menu here, as well as beer and wine and kids menu. Favorite sandwiches of mine are the tuna melt ($7.50), Rosewood deluxe ($8) and Rick’s Dip ($8.50), a French dip with horseradish mayonnaise. 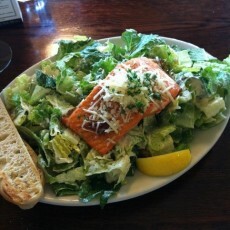 Last night, I tried the blackened salmon Caesar salad ($12.50). The salad was perfectly dressed, and the salmon cooked nicely, but there was nothing blackened about it. With blackening seasoning, you’d expect Cajun spices, but they weren’t present. Nonetheless, it was a good salad. 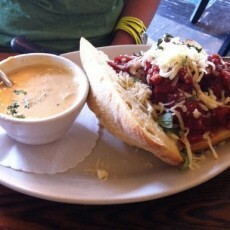 My friend Christina had the meatball sandwich ($9) and their soup of the day, which was beer and cheese soup. All together, a good sandwich, with pork meatballs and marinara sauce on a rustic roll. I swear that sandwich used to be served on a baguette, which would be preferable in my mind, but I could be wrong on that. Don’t miss their cowboy cookie ($2), a giant cookie with oatmeal and chocolate chips that’s really delicious and big enough to split. Get it as an open-faced ice cream sandwich if you’re really feeling crazy ($5.50). Rosewood Cafe | 3323 N. 26th St, Tacoma | 253-752-7999 | Open daily 11:30 a.m.-9 p.m.